Village View Post: HAPPY TENTH OF SEPTEMBER BELIZE!! I believe that many patriotic individuals would become angry with me for even mentioning the term “skirmish” when referring to the Battle of St. George’s Caye because it is probably the same word which has been the foundation for the critics’ saying that this historic battle never happened. On the 10th, September 1798, Spain’s seventh attempt to displace the settlers and burn their settlement to the ground was met with such opposition from the Baymen that within hours, only the back sides of the ships and the inside of their sails could be seen in the distance putting an end to Spain’s attempt at invasion and giving Belize its true Independence. Whether it was the strong challenging words of Thomas Paslow, one of the dominant patriotic leaders, who called the members of the groups cowards and told them that, 1“any man who will not defend his country is not fit to reap the benefits thereof” or whether it was the Flowers Bank fourteen who silently paddled down the Belize River in that still dark June night in 1797 to cast their vote to stay and fight, but on June 1, 1797, the final vote was 65-51: history was made and the greatest feat was carved into our history. 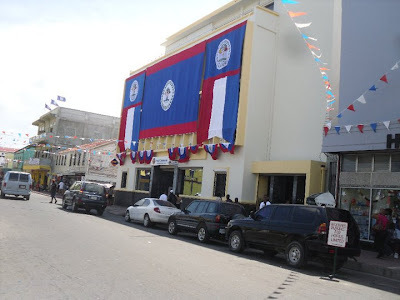 This history has been repeated over and over since that fateful day and it has remained as the greatest act of Belizean history to this day despite efforts by many to dispel it as a small unimportant skirmish; however, it is almost entertaining to join us on the Tenth in Belize City in recent years and see those same individuals holding and waving bright Belizean flags and singing at the top of their voices those patriotic tunes of old which has survived to this day. My brothers and sisters, the Tenth is alive in Belize and I am even aware of packets of patriotic Belizeans abroad who keep the tenth alive in the traditional way. There is no doubt that Belize’s history is strong and that is a sign that Belize is growing and preparing to take its rightful place in the World. The seventh attempt by the Spaniards to invade the settlement occurred on the 10th September, 1798 and it was the last attempt. Thereafter, the settlement prospered in peace and this is the heritage we have inherited today and our children continue to inherit everyday as new Belizeans are born. We have much to be proud of: our history, our beauty, our diversity, our natural resources which continue to be discovered, our attractions which continue to build our Tourism Industry, and so much more which make Belize so unique and a home and haven to people from so many other countries. But let us not forget that all these are not limitless and even the face of the Belizean man and woman is changing with each new generation which emerges from the womb. One of the answers to preserving our heritage may be found in a true understanding of why we take to the streets every year on the 10th September. If it is to celebrate in true Baymen spirit, is it only to march, sing, and hail them or is it to remind us that the peace, freedom, and safety we enjoy today is because they chose to put their lives on the line and fight the enemy who wanted to take away their homes and freedom? On behalf of the St. George’s Cay Day Society, the Loyal and Patriotic Order of Belize-Miami Chapter, PSWG, (please add your name here), and of course, yours truly, I wish every Belizean at home and abroad a Happy, Safe, and Blessed Tenth…Hip Hip Hooray! What a very positive and enlighting article about our country's history. I am really appreciative to Linda for this opportunity that others can help to educate and keep us inform about current events and such article like this one that is teaching so many the history and bravery of our forefathers. Just over this past weekend at one of the many September celebrations that is held in Florida, the first of many was held in Daytona Beach,and I was privileged to see some of Belize's history on display. I had goose bumps reading about our forefathers that made the decision to stand and fight. Lets keep the education going especially for the belizeans whose children are born and raised in other Countries. Thank you for a job well done. Thanks for sharing. It's a very good article and I enjoyed reading it. Happy 10th to you also. I don't have any Pokeny Bwai stick nearby, so I'll wave my golf club in honor of this historic event. Keep up the great work. United and proud, moving forward, I am BELIZE. Happy and safe 10 celebrations all!!!! This is a great article. Happy "Tenth" of September to all Belizeans!! Hi Ms. Linda and Happy New Year to you & yours...yes, very good and historic article on the tenth. Excellent beautiful article....thanks for sharing...Yu Betta Belize IT....!